A Course Guaranteed To Reveal How You WILL Win The Paper War once and for all! An amazing opportunity to change the way you work and make your income soar! You’ll enhance your productivity and revolutionise your work space. You’ll be delighted with how easy it is to clear the clutter and stop the stress – once Robyn shares her secrets with you. You’ll be amazed how much more time you have once you’ve won the battle with your paperwork and emails. 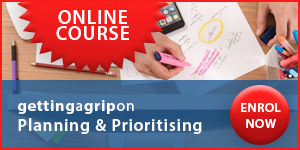 BOOK NOW and pay only $200 to secure your spot on Robyn’s 3-week “Getting A Grip On Paper & Information Overload” webinar series. It’s easy, interactive and all you will need is an internet connection! You don’t have to travel – it happens wherever you and your computer are. You only need a computer, a good broadband connection and a headset. You get me at a very affordable price! A – day session with me is usually $6,000 and this programme is normally $675.00. Only NZ$200 for the 3 sessions. (About $67.00 per session!) 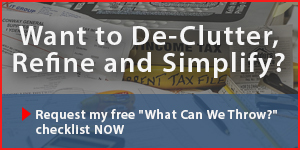 How much is it worth to get free of the stress of a messy office! Because it’s spread over 3 weeks you’ll be supported through the pain of learning new habits, plus you can email unlimited questions not only for the duration of the course but also for up to another 6 weeks. Pre-work – Before-photo and an email from you to help me identify your particular issues. Session 2 – More on Setting Up Systems and Clean Up; some Quick Email Tips. Session 3 – How to Maintain the Good Intentions. An e-copy of ‘Getting A Grip On The Paper War’ . Value: $27. A monthly emailed follow-up for 7 months after the course concludes. Value: $95. Unlimited email support for 6 months. Kirsten’s Office – Before Participating Kirsten’s Office – After Participating in the webinar! Secure your space today by clicking the button below. Spaces are limited.